Like adult acne and high heeled crocs, MissingNo. should not exist. Perhaps one of the most infamous Pokémon — and perhaps not a Pokémon at all — MissingNo. 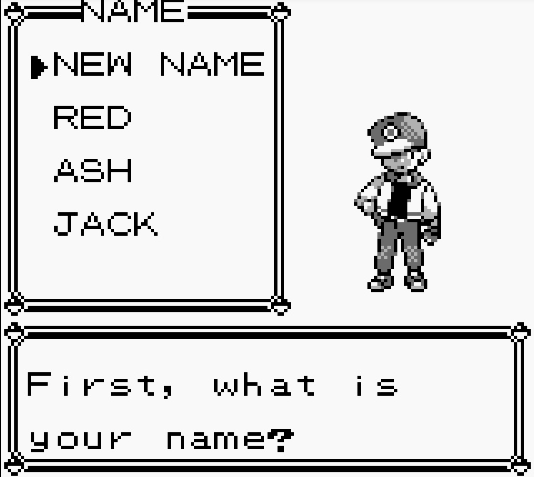 was found lurking around the Cinnabar Island coast to my absolute unparalleled horror. Sure, encountering MissingNo. in the Blue or Red version was an essential part of the Old Man Glitch, and those rare candies, Master Balls and nuggets weren't going to duplicate themselves. But MissingNo. and his graphics-distorting powers definitely gave us all the wiggins as little kids, and his legend looms large today. Even still, the most unsettling part of the legend goes back to how this creature, this "Misssing Number," should not exist. However, MissingNo. does exist, and though we've yet to decrypt that existence in full, here's a little bit of data on the iconic bundle of bytes. 1. 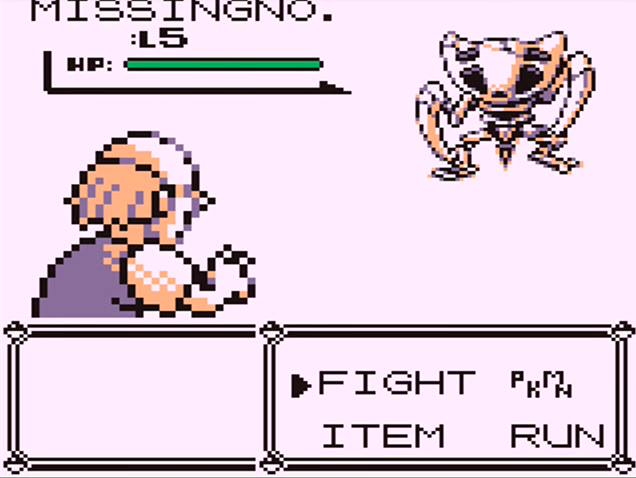 The appearance of MissingNo. is largely based on your trainer name. Believe it or not, MissingNo. 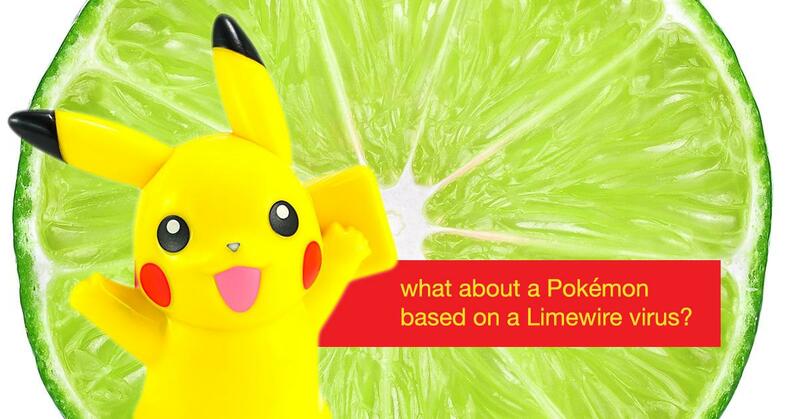 was not created the day someone at Nintendo pitched, "Well, we have a Pokémon based on a cat and a Pokemon based a dog, what about a Pokémon based on a Limewire virus?" "Genius, Phil, genius." The how/why behind MissingNo., however, is a complex explanation peppered with "IDK" and phrases like "hexidecimal numeration." That sounds like math, and that's not why I came to the internet today. What we do know, however, is that MissingNo. appears when your trainer name has either a G, H, J, M, S, T, :, ], a, b, c, m, o, p, or v as the third, fifth, or seventh character. When you go through the Old Man, your trainer is temporarily overwritten with "OLD MAN," and your name is stored somewhere else. The half-land, half-water strip of Cinnabar Island is technically capable of spawning Pokemon but definitely has an identity crisis and doesn't know what kind to spawn. 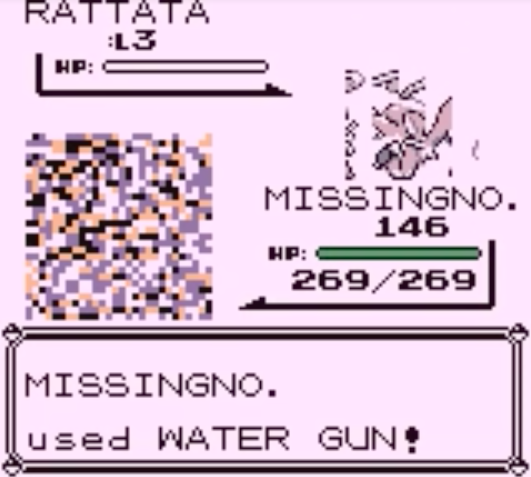 So when you go up and down the coast of Cinnabar Island, you're now able to draw Pokémon based on your name, and MissingNo. (or some other glitch) appears as a placeholder. 2. MissingNo. is tall AF and would therefore do very well on Tinder. As he exists in Red and Blue version, MissingNo. stands at 10 feet. 10. FEET. For frame of reference, that would be like seven Pikachus standing on each other's shoulders. Maybe that would be more meaningful if Pikachu was like, real, but he also weighs 3507.2 lbs, so I think we can all agree that you wouldn't want to come across a monolith like this IRL. 3. MissingNo. is a bird/normal type. Pidgey, Spearow, Farfetch'd and...MissingNo.? Yeah, my memories of MissingNo. definitely involve him emerging from the waters all beaky, wings flapping about. 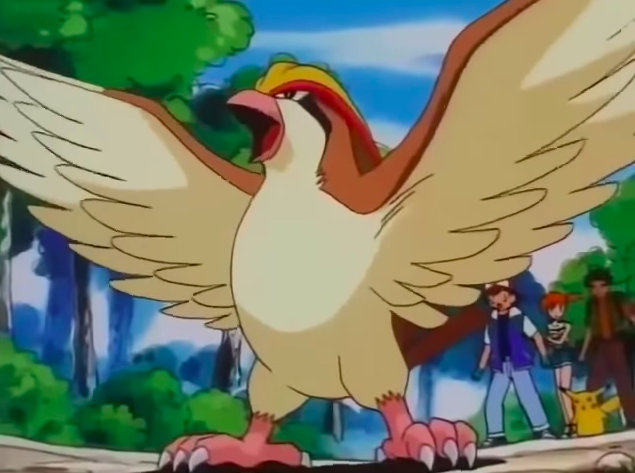 Incidentally, "bird" isn't even a type that exists in those early Pokémon game, this seems to be an early term for "flying." 4. Even the nature of MissingNo. 's attacks are a glitch. Technically if you want MissingNo. to fly, Godspeed — he can't learn any moves organically, but he can take TMs and HMs like a champ. If you catch him, however, you'll learn that he already knows Sky Attack, and not one but two Water Guns. Wait, maybe you misheard me there. I don't mean MissingNo. is wielding two Supersoakers, I mean that he has two slots for Water Gun. This glitch, I swear. 5. MissingNo. comes in many different forms (and sprites). There are, apparently, 39 different versions of MissingNo. 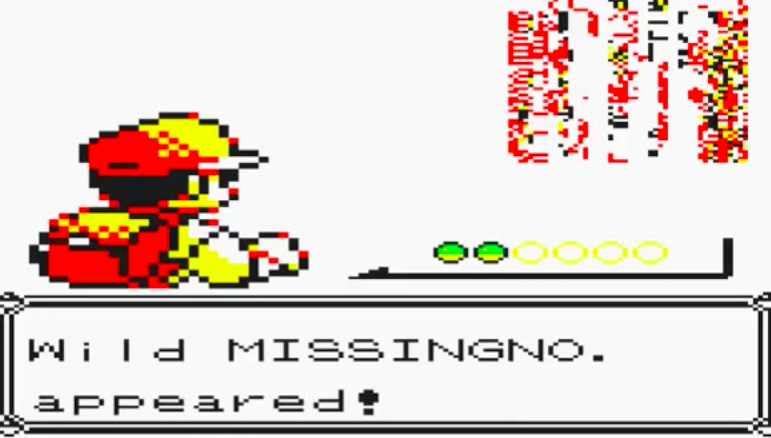 The most common appearance of MissingNo. is that iconic mix of blocks, yet it's not limited to just one lewk. That's the first 36 backward L-shaped versions of MissingNo. To add another veneer of creepiness to the Pokemon's legacy, MissingNo. can also appear as the sprite of the Kabutops fossil or Aerodactyl fossil, all skeleton-y and weird. Oh, and you know how in Lavender Town you stumble into all sorts of "ghosts" if you explore Pokemon Tower without a Silph Scope? You can also find that ghoul masquerading as MissingNo. 6. MissingNo. or one of his unholy relations exists in Yellow Version. 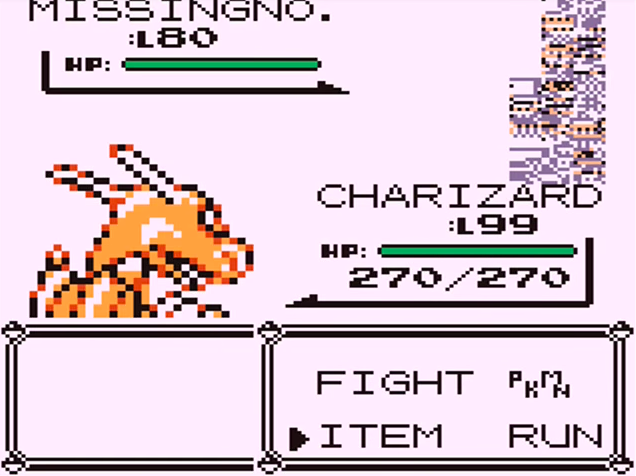 Pokemon Yellow removed the "Old Man Glitch" and as such you'd think that MissingNo. doesn't exist in the game. But proving Yellow Version is just as Godless as the Blue and Red, MissingNo. can be found, particularly in a little patch of grass in Cerulean City. This FAQ explains the journey in full, but between you and me? It's not worth the effort. Unlike the Red/Blue MissingNo., which has a wonderful legacy and will graciously grant you items, this version of MissingNo. is ruthless and vile. He's like this horrible, boxy, sprinkling of evil that Yellow version diarrhea-ed out as an afterthought. Most of the time when you encounter him the screen will turn pitch black for what feels like centuries and/or the game will crash, and the after-effects? Little trainers running around everywhere and more. I do not recommend pursuing Yellow Version MissingNo., but whatever, I'm not your mom and you're going to do what you want anyway. 7. Nintendo low-key lied about what MissingNo. does to a game. So by the dawn of the millennium hoards of wee ones had ruined their graphics out of their greed for more items. No doubt that resulted in crying to mommy and daddy, who were in turned PO'ed that this $30 game was falling apart. Commence the angry phone calls. Eventually Nintendo included information about MissingNo. aka Pokemon 000 (huh) in their consumer troubleshooting page. Their advice is... interesting. "To fix the scrambled graphics, try releasing the MissingNo Pokémon," it reads. "If the problem persists, the only solution is to re-start your game. This means erasing your current game and starting a brand new one." But that isn't how to fix any graphic jumbles; as long as you click on a normal page like a Pokédex entry or the Trainer page, it should fix any immediate issues. Needing to re-start your game sounds like an old wives tale meant to spook kids from pursuing MissingNo. in the first place. 8. 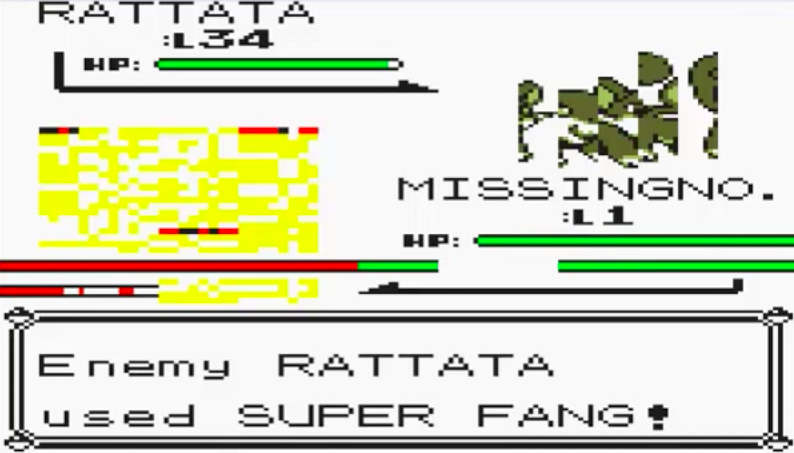 And incidentally, your playground BFF lied about MissingNo. erasing your save file. MissingNo. is a devilish fiend, make no mistake, but he doesn't have game-erasing power. Though rumors ran rampant that MissingNo. would corrupt your save file (and again, Nintendo didn't make a convincing argument against the notion) MissingNo mainly messes with the visuals. Most after-effects are temporary, and the only thing that is perma-screwed is your Hall of Fame data. 9. There was a sp0000ky theory that suggested MissingNo. 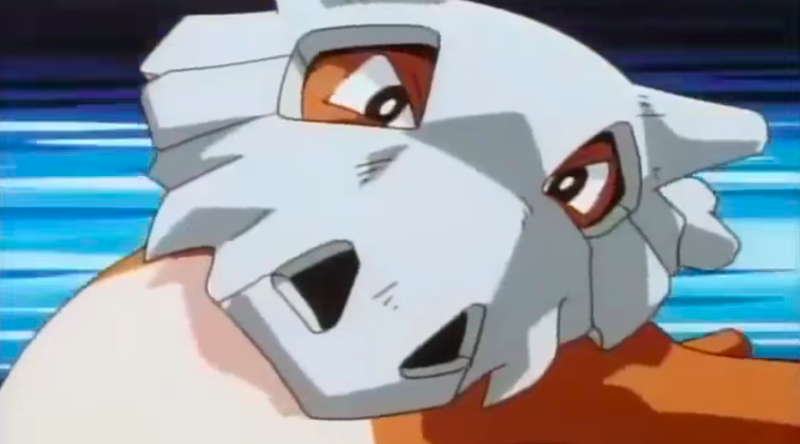 is the missing link between Cubone and Kangaskhan. So in short, this suggest that baby Cubones are baby Kangaskhans who lost their mother, and take their parent's skull on as headgear. Kangaskhan, therefore, was intended to be the final form of Marowak. The theory says MissingNo. comes into play because when Nintendo decided make Kangskhan into her own thing, they didn't bother to rewrite the code and just moved the missing number to another slot. 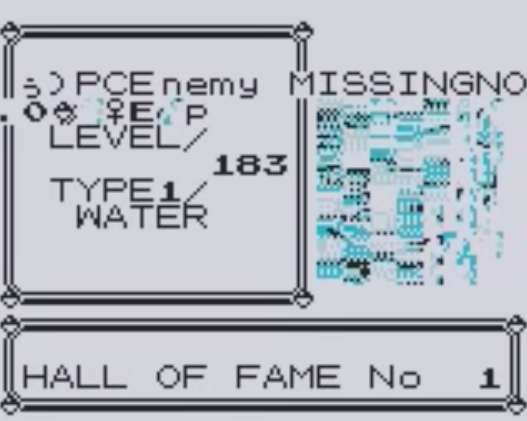 The "proof" points to how MissingNo. evolves in Kangaskhan. 10. MissingNo. 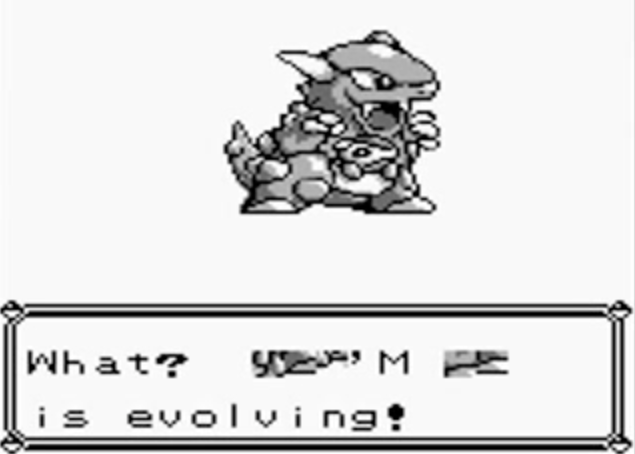 can't evolve, but his glitch-sibling 'M can. This is something I apparently misremembered; the one time I caught a Cinnabar-dwelling glitch Pokemon it evolved into a Kangaskhan. But turns out that's actually 'M, the Christina to MissingNo's Britney. 'M pretty much serves the same purpose as MissingNo. but can evolve into a Clefairy or, as mentioned, a Kangaskhan. Now granted, at the time it was a big win to not have to grow old in the Safari Zone looking for that marsupial Pokemon, but 'M will gladly garble your graphics harder than it's twin. 11. Another theory suggests MissingNo. is made out of crushed little Pokémon. Pokémon designs, numbered. And some of them, like that moose travesty up top, didn't make the final cut. So what's the big deal? Twitter user crystal_rby pointed out that this hints at what MissingNo. 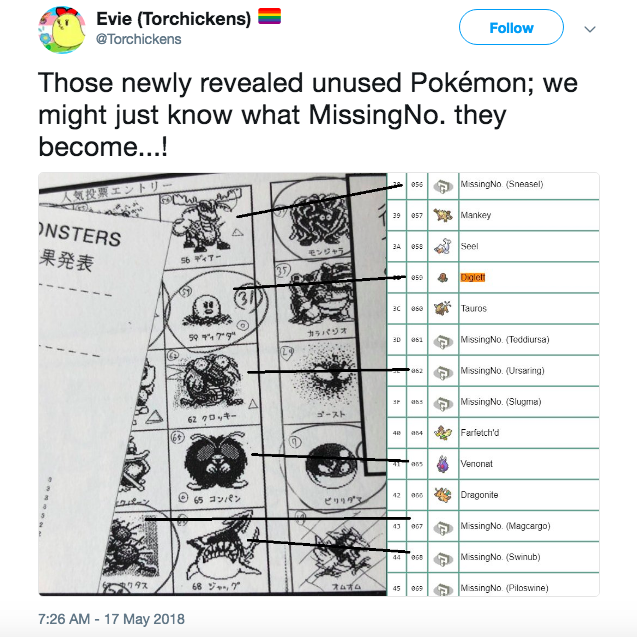 could possibly be, writing, "They are not necessarily a leftover of Pokemon data that was inserted and then removed; they just had someone make numbered designs, and the Pokemon were inserted following those numbers, thus leaving empty slots." This ties in to the common belief that there were originally 190 Pokemon designs. 190 -151 = 39 MissingNo. Ugh, there's that math again. 12. MissingNo. is still causing bugs to this day, particularly in Pokemon Sun and Moon. As late as 2017, Redditors uncovered that MissingNo. was still a force to be reckoned with in Sun and Moon versions. 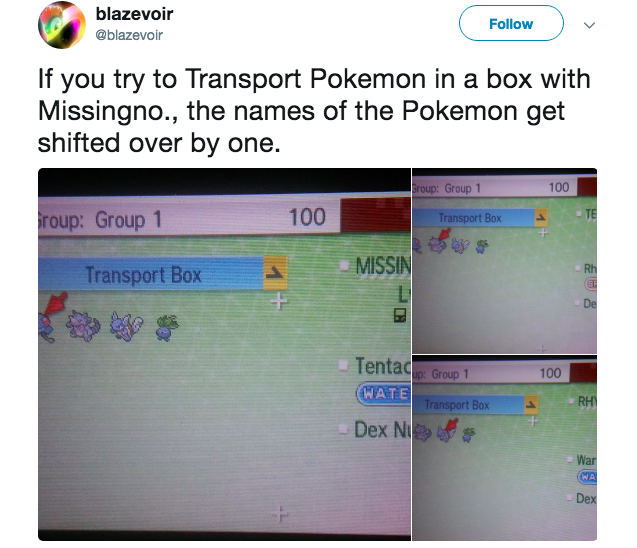 If a player tried to transfer the glitch Pokémon from an older game, a bug switching the names of each subsequent Pokémon. In this case, the trainer now had a Raichu named Hitmonlee. As for MissingNo.? Well, that's the most harrowing part: he mysteriously disappeared from the player's line-up. But I remain skeptic...I'm sure he's still out there, biding his time, ready to cause chaos for many generations to come.